Webguru Infosystems, an ISO 9001:2015 certified agency, provides dynamic and results-driven social media marketing services. We take into account the current brand value of a business and, work toward enhancing it. We use futuristic strategies and creative designs for maximum impact. Our team of proficient social media optimization and marketing specialists is adept at managing media platforms like Facebook, Twitter, Google+, LinkedIn and Pinterest. Together, we boost your social media presence, generating more leads in the process. The Social Media is a powerful platform to reach your prospective customers. More than 70% of people are daily active on the leading social media platforms like Facebook, Twitter, LinkedIn. Once your brand is popular in the social media, it will show on the newsfeeds of your target audience. The job of a professional social media marketing agency is thus to popularize your brand and improve its visibility. At Webguru Infosystems, we have a team of qualified and creative social media experts developing successful campaigns and delivering measurable results. As business owners prefer ‘leads’ more than ‘likes’, our results-oriented social media services focus on generating quality leads by creating brand awareness, promoting engagement and increasing the number of conversions. All social media platforms are unique and should be treated accordingly when optimizing them for individual brands. For example, a retail business will do good on Facebook, a web agency will generate more leads on LinkedIn and photography website will create havoc on Instagram. 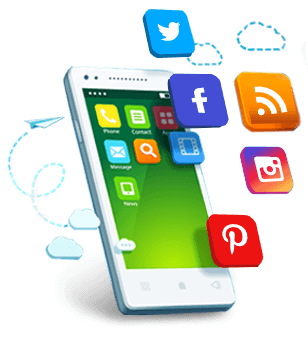 At Webguru Infosystems, our social media management services leverage the different flavours of each platform to build you a strong presence in the social media. We launch, develop and monitor campaigns based on your target demographic roping in your business specifics. But, What Makes Us Special? Get quick, lead-oriented, industry-specific social media marketing services that work. We keep upgrading our strategies to maintain consistency in our performance. We have dedicated social media marketers for campaign monitoring, upgrading and maintenance. All our activities are driven by the main objective – Generating more business.